Memorial Day weekend is one of the biggest weekends for racing the world over, and for THR drivers Jeremy Lucas and Luke Wilwert, it was certainly no exception. 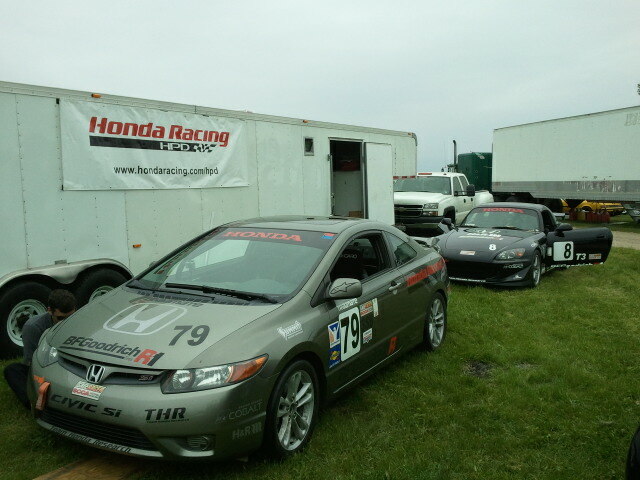 The long weekend meant an opportunity to earn valuable championship points at an SCCA Double National race at Grattan Raceway in Belding, MI. Jeremy continued his campaign to qualify for the SCCA National Championship Runoffs in the Honda Racing/HPD/BFGoodrich Honda S2000 CR in the Touring3 (T3) class. Grattan Raceway is one of Jeremy’s favorite tracks, and it showed in the results, with Jeremy out-qualifying both the other T3 cars and the T2 cars for both races. However, qualifying is one thing, but the race is whole different animal, and with all the higher-torque cars starting behind Jeremy, he quickly found himself in seventh position heading into Turn 1 after the green flag dropped for Race 1, with Richard Fisher in the T3 VW GTI having taken the early lead. A few laps in, Jeremy was able to get back by Fisher, and he maintained that advantage to the end of the race for the win and a third-place finish overall. The fact that Grattan had recently completed a repaving project also allowed Jeremy to set a new class lap record with a time of 1 minute, 28.258 seconds during the race. Race 2 brought new T3 challengers in the persons of John Heinricy and Chris Puskar, who arrived for the second half of the weekend after competing at the Lime Rock Grand-Am race a day earlier. It was a similar story for Race 2. Starting on the overall pole, Jeremy was in sixth place going into Turn 1, as the higher-torque cars motored by his S2000. Later in Lap 1, contact between Fisher and Heinricy allowed Jeremy to take the lead. Halfway through the race, Puskar caught up to Jeremy as he was being held up a by a slower but higher-horsepower T2 car. Luckily, the T2 driver realized this and let both Jeremy and Chris past, but there was no longer any gap between them. After many laps of nose-to-tail and side-by-side action, Jeremy took the checkers just in front Chris for the victory in Race 2. 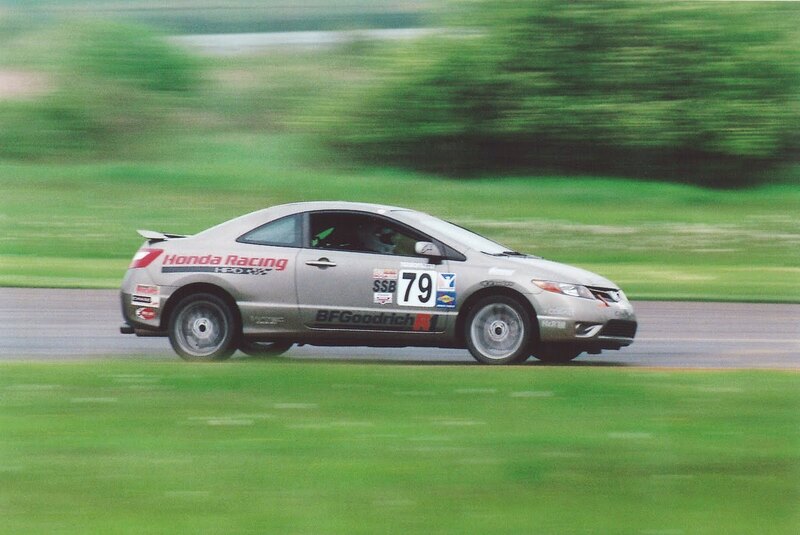 Luke Wilwert made his SCCA National racing debut, driving the Honda Racing/HPD/BFGoodrich Honda Civic Si in the Showroom Stock B (SSB) class. Luke had his work cut out for him in the form of stiff competition from a Ford Mustang, not to mention needing to quickly come to grips with Grattan Raceway, as he had never been there before. Luke’s lack of experience going around Grattan’s tricky 12-turn layout meant he would start Saturday’s race behind the Mustang. A poor start left Luke mired in traffic for the first few laps, which allowed the Mustang to build a substantial lead. Over the next 15 laps, Luke slowly clawed back until he was right on the Mustang’s bumper. The last few laps would see a fierce battle for the class win, which unfortunately finished with the Mustang just a few tenths of a second ahead of Luke’s Civic Si. After his exciting battle with the Mustang, Luke was more familiar with the track layout, which meant he was able to qualify much better for Monday’s race. Luke put in a qualifying lap just three-thousandths of a second slower than the track record, putting him well up the grid from the Mustang. Fast, consistent lap times meant Monday’s race went much smoother for Luke, as he was able to capture the class win by more than 37 seconds.